Happy Meal and I discovered, just before departing for Las Vegas (spring break), that Steak 'n Shake served a 7x7 cheeseburger on their Up All Night Menu. Sweet serendipity--we were staying at South Point, which is where the local (only Steak 'n Shake for 1,000 miles) was located. While the Las Vegas location had limited hours, they were kind enough to oblige our obscene request. Yes, I was bucking for Father of the Year by taking my 10-year old son to Las Vegas for his vacation. The burger was actually quite a bit smaller that I had anticipated. Happy Meal and I split the monster. 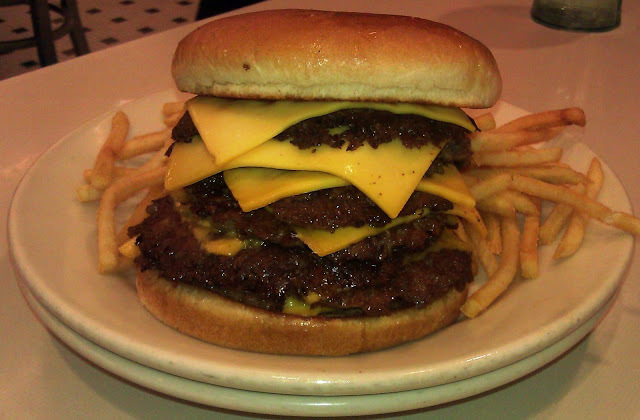 At Steak 'n Shake, the thin burger patties were only about 2 ounces each, so the total burger weighed in at less that a pound. How was it? It had 7 slices of melted American cheese--it was damn delicious! 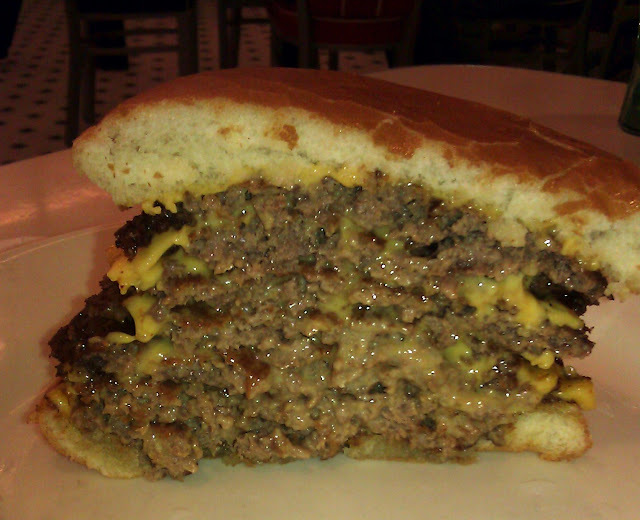 Steak 'n Shake applied a world-class sear to the thin patties, so the burger was 14 ounces of sear with melted cheese. That melted cheese worked its way through everything. It was creamy and savory. The beef was crumbly and dark. This really was a spectacular bite. Shockingly, the meat to bun ratio was not shot to hell. The bun magically contained the stack of meat and cheese in this mighty cheeseburger. Honestly, I was not impressed with the standard cheeseburger the last time that I visited this Steak 'n Shake location. On this visit, about two years later, the 7x7 was spectacular. The price was higher than the special menu cost of around 8 bucks, but even at the $10.29 that we paid, it was a tremendous value. We split the massive cheese burger, which came with fries, and we were both full but not grossly stuffed.